The CH Throttle Quadrant USB is the highly anticipated multi engine throttle quadrant you've all been waiting for. Now, gamers and pilots alike can experience the most realistic simulated flight control available. With features including physical detents, reverse thrust and full programmability with 6 axis and up to 24 buttons, you can utilize 350 button positions. This Throttle Quadrant is the perfect enhancement to the Flight Sim Yoke and Pro Pedals, or with the Fighterstick and Pro Throttle combination. Whatever setup you choose to use, get the most out of your flying experience with the CH Throttle Quadrant USB. 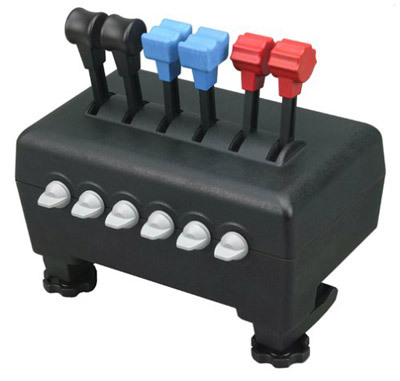 Removable blue, red, and black knobs included with each Throttle Quadrant, allowing for different configurations. Review: Dependable, straight forward intuitive design, and not a piggy bank breaker. I liked the CH Throttle Quadrant enough to buy another. Pros: Consistent digital values at each end of the range on the lever controls. This means you should not have to worry about inconsistent results when you use these in the flight simulators. The construction seems to have good quality. I don't expect I will have to worry about wearing the throttle quadrants out. Nice quantity of switches and of levers. The resolution of the lever controls is good. So, I don't have to worry about the minimum change that I can make in the settings being too high for good control of the aircraft. Review: The worst thing about this product is the lack of information related to how it has been set up for the Microsoft Flight Simulator (i.e FSX for me) by other users. That information can be found with some effort to sort the available online information. The initial calibration and setup with the CH Control Manager is fine but does not give any ideas on how others are using the available buttons. Also, I found that I required the FSUIPC product by Peter Dowson to do a number of the things that I wanted to do (e.g. set up the throttles, mixtures, and prop pitches for appropriate engagement of feather, reverse thrust, low and high idle to name a few). That is not a fault of this product. Once I got to the right information and made the determination that I needed FSUIPC, I did not have much trouble setting up two of these quadrants to be used together with the CH Pro Pedals and the CH Eclipse Yoke. With this setup, I have the necessary control levers to cover the throttles, mixtures, and props for any aircraft having four or less engines with independent control levers for each function on each engine. I also use the latest version of X-plane and there are no problems using all these CH Products devices with it. I previously used a well-liked flight joystick with rudder controlled by twisting the joystick handle. This CH setup with FSUIPC for the Microsoft Flight Sim allows me to have much better control and put even the "Super Heavy" jumbo jets down with room to spare in conditions that I would have had trouble keeping the aircraft on the runway with my previous control setup. With X-plane, it is like the sim and these controls were designed for each other. I have my setup with FSX and FSUIPC on these controllers mirroring the same setup I have with them in X-plane. So, I can use the same levers or same buttons for the same thing in either X-plane or FSX. So, I have no problems switching between the simulators. These throttle quadrants are very consistent. That is, I always get the same reading (i.e. digital values) at each end of the travel of the throttle levers. The bottom line is that I am very happy with these throttle quadrants (and the other CH Products devices I have). Pros: See above, easy setup, good feel. It would hard to figure out how these could be much better for a general use in flight simming. Review: I actually bought two of these to get all the axes that would be needed for a 4-engine prop aircraft. The only real negative is the lack of instructions for setup of the most likely uses of these throttle quadrants (i.e. MS flight simulator and X-plane). Those were found without any major difficulty by searching online. With MS Flight Simulator, make sure you get FSUIPC to enjoy the full capabilities with the most realism. I have had these for a few weeks now and once I got them set up appropriately I found it hard to leave the flight simulators alone. I will probably build a portable mounting platform for these and the CH Eclipse and CH Pro Pedals that I have. That would allow me to move them out of the way when I want to use the computer for other things. Getting back to the review, these have a good feel with respect to the real aircraft levers that they emulate. I like the CH Control Manager, which makes the initial setup pretty easy. Review: First time I've bought a product that didn't need adjusting, works like a charm. Cons: Probably takes up more horizontal space than an aircraft-specific throttle because there is no vertical offset on the lever knobs (e.g. throttle lever knobs higher than pitch or mixture knobs which would allow the levers to be closer together). This is not a real issue for a quadrant meant to work for all sorts of different aircraft types. Only an issue if someone was building a cockpit for a specifc aircraft and wanted a high degree of visual realism..
Cons: Could be a little more setup information for the obvious uses. Cons: The clamps for holding this to the desk are useless. Cons: Detents add nothing to the experience. Q: Will this work with my FSX and single and multi engine aircraft. Does it just plug into the computer somewhere to get it to work. How wide is the unit. A: Yes, this will work with FSX on both single and multi engine aircraft. Q: I am trying to find controls that simulate my G1000 equipped Diamond DA40 (center stick, right hand throttle quadrant, rudder pedals) for my iMac using X Plane. What would you recommend? The Saitek Cyborg X Flight Stick and Saitek Pro Flight Throttle Quadrant paired with the Saitek Pro Flight Rudder Pedals would do a nice job of simulating a DA40. Q: It looks like this quadrant can be configured for both single engine and twin engine ops. True? A: This throttle quadrant can be used for just about any engine type as you are able to completely customize the different controls on it. A: The total shipping weight is around 3 pounds. Q: Is this compatible with a Mac running X-plane 9?